His name was "Erik" and he was a deformed composer living on a lake below the Paris Opera House. We know him as 'THE PHANTOM OF THE OPERA". As of this writing there have been 7 motion pictures that are based directly upon the novel, 17 other films that either reinterpret the character, or play off Gaston Leroux's title, 12 television versions, 29 stage productions and 4 radio programs. Not to mention the many articles, such as the one you are reading, and books on the subject. This article will look only at the motion pictures and television versions. Gaston Leroux's "Opera Ghost",or just "O.G." haunted the Paris Opera House and before I go into his tale and it's many adaptations. I felt it was necessary for my reader to meet the real star of the story. Above the top photo is the main entrance to the Opera House. The next photo the west side and the bottom the east side of the home of the "Opera Ghost". It took 14 years, from 1861 to 1875, for the 1,979 seat structure to be completed. The opera house is known as the "Palais Garnier", for the architect that built the building, and is located on one of the four grand boulevards of Paris. That is the "Boulevard des Capucines" named for a Convent of "Capuchin Nuns". Whose flower garden faced the street prior to the French Revolution. When you enter the main floor of the Opera the visitor, or patron was in the "Grand Foyer". The following is a old drawing of the "Grand Stair Case" and a recent small color photo. 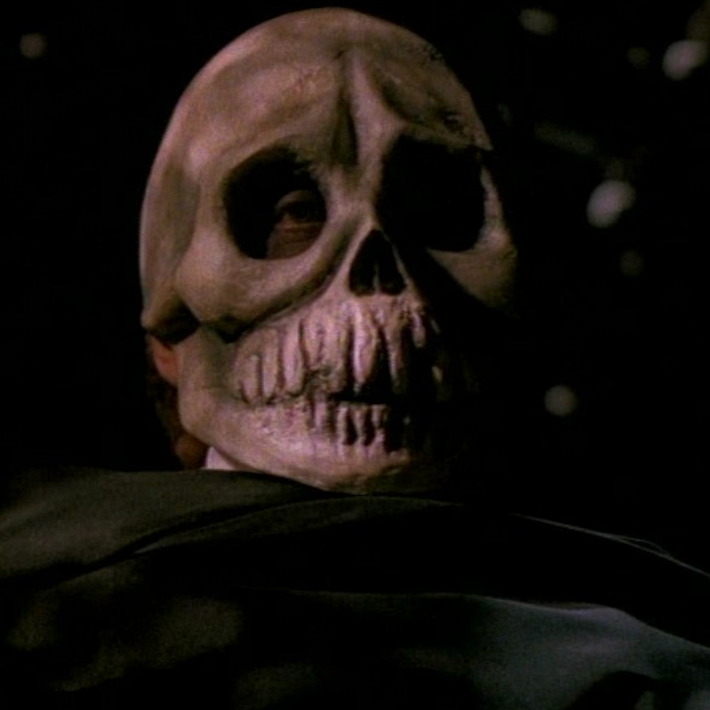 The above is of course the stair case that "The Phantom" enters dressed as "The Mask of the Red Death". The opera house's design was the result of an architectural competition announced by Napoleon III on December 30, 1860. The construction was awarded to Architect Charles Garnier. The work started with the excavation for the foundation from August 27 through December 31, 1861. While laying the foundation for the opera house the basis for part of Gaston Leroux's story came into being. On January 13, 1862 the first pouring of the concrete began and an unexpected "Problem" developed. The "Palais Garnier" needed a much deeper basement than any other Paris structure, because of the need to store props, costumes and other items from previous and current productions for reuse. The "Problem" was the "Ground Water". The levels were much higher than anticipated and a means of controlling the water was required. In February Wells were sunk and in March a system of eight steam pumps installed. The pumps were run 24 hours a day, but the "Ground Water" would not dry up. 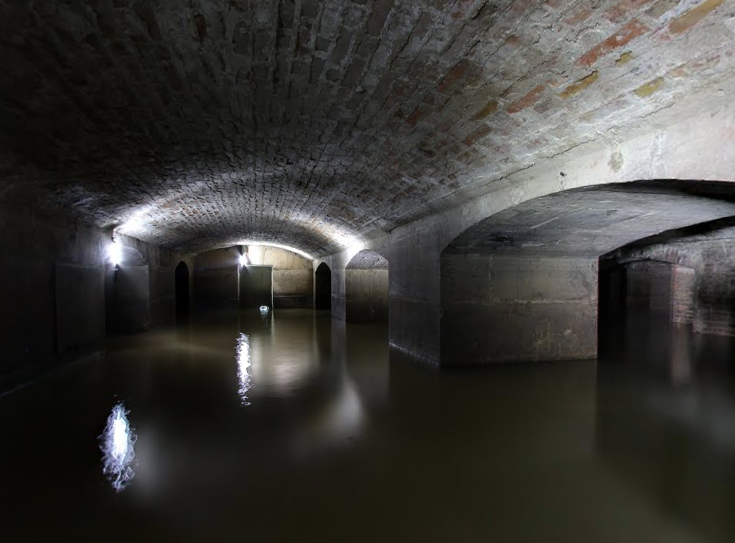 The only solution was to create a double foundation to prevent the moisture from effecting the superstructure of the Opera House. A contract to have this second foundation was signed on June 20, 1862 and what became a "Water Tank" to contain the seepage was created. A story began to circulate sometime later that became the first of the "Palais Garnier's" Legends. The Opera House had been built over a LAKE. 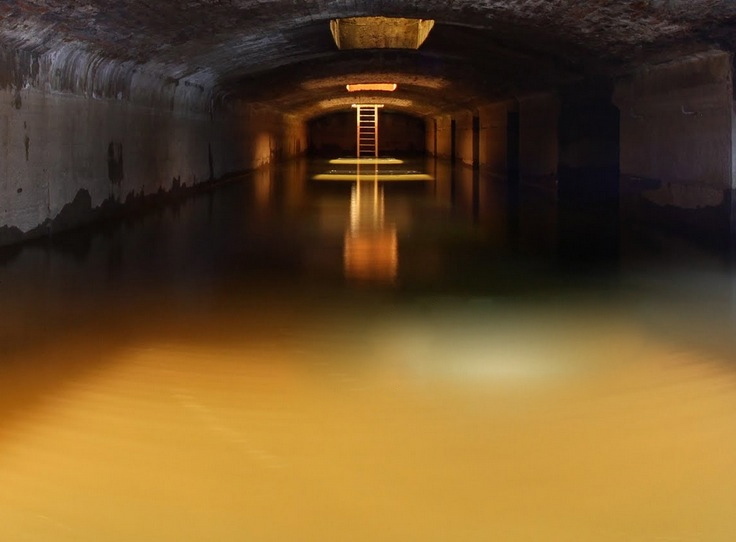 Above the ground water seepage under the "Palais Garnier" in the water tank built by Garnier. The "Opera Ghost" was he Fact or Fiction? Gaston Louis Alfred Leroux's work "Le Fantome de l'Opera" was first published in serialized form in "Le Gaulos", a French daily newspaper, in 1909. The hardcover novel version was first published the following year in 1910. Although some sources move it to 1911. When thinking of images of, call him whichever you will,"The Opera Ghost", "O.G." or "The Phantom". One classic set piece in the novel must come to mind. It is were "Erik" cuts loose the massive Chandelier and it falls upon the audience. There is a bit of a truth to that tale, but not apparently by any "Fantome". In 1896 a women, according to the following newspaper article, working as an a concierge (door keeper) was killed in the Opera House. When the chandelier fell and also caused a fire, or was she a construction worker as some others state? Apparently a counterweight failed causing the entire chandelier to fall. Further inspiration for Leroux’s story came in 1896, when the counterweight from the building’s grand chandelier fell, killing a construction worker. Leroux wove the incident into the novel’s climactic moment, during which Erik (the Phantom) kills an audience member by causing a chandelier to fall during a performance and, in the furore that follows, kidnaps Christine, dragging her down to his underground home. It will be remembered that, later, when digging in the substructure of the Opera, before burying the phonographic records of the artist's voice, the workmen laid bare a corpse. Well, I was at once able to prove that this corpse was that of the Opera ghost. 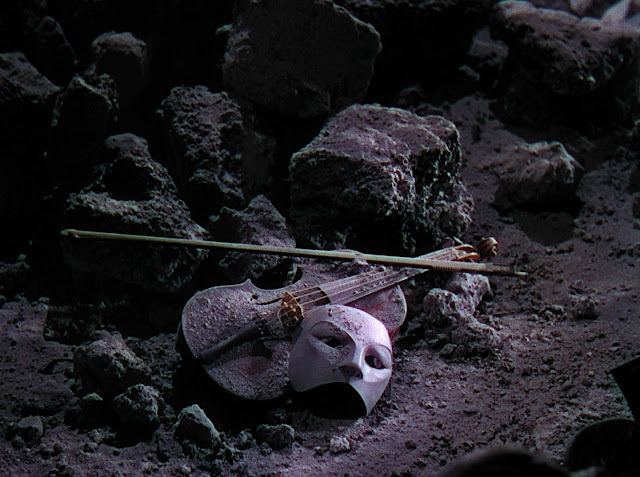 However, perhaps the most ingenious blending of fact and fiction in The Phantom of the Opera is in the prologue, when Leroux mentions the burying of phonographic recordings in the cellars of the opera house. He explains that, while the cellar is being prepared to house the recordings, a corpse is uncovered that is identified as Erik’s. There may not have been a body, but the burying of recordings did take place. In 1907, the Gramophone Company sealed 24 records in two containers and locked them in the cellars of the opera house, to be opened 100 years later. In 2007, the containers were opened and the records digitised by EMI, which released the collection as Les Urnes de l’Opera. I now come to another "Legend" about the "Palais Garnier" and another architect hired by Charles Garnier to assist him named ERIC or sometimes written as ERIK. This unusual architect's life has been researched and documented by many. In her Internet Article "Unmasking the Phantom" from August 26, 2014. Rozena Crossman speaks of meeting a French authority on Gaston Leroux and his novel> This was a "Literary Professor" by the name of Isabella Casta. According to Casta, Monsieur Leroux heard a strange rumour during a visit to the Opera House in 1908 that one of Garnier’s architects, named Eric, had asked to live underneath the incredible structure … and hadn’t been seen since. This is the story of Eric as documented by Professor Casta and you may take it as truth or fiction, but decide for yourself as records of his hiring still exist. Eric, or Erik was born in a small village in Normandy, near the town of Rouen. The boy was born was a disfigured face and his own parents abandoned their child at the age of eight. Somehow he was picked up by a traveling circus and spent the next seven years of his life as a side show freak. While this traveling circus was in Persia the boy escaped and started to work as an entertainer for the Shah. Let me stop my tale for a moment and return to quoting Gaston Leroux's "Prologue". --------and it was as much as he had done to listen to the evidence of a witness who appeared of his own accord and declared that he had often met the ghost. This witness was none other than the mam whom all Paris called the "Persian" and who was well-known to every subscriber to the Opera. Later Eric became an architect's assistant and advanced to full architect designing harems. Which gave him a more comprehensive knowledge of his craft. He returned to Paris and was given an Assistant position on the construction of the Opera House and became extremely familiar with every corner of the building. 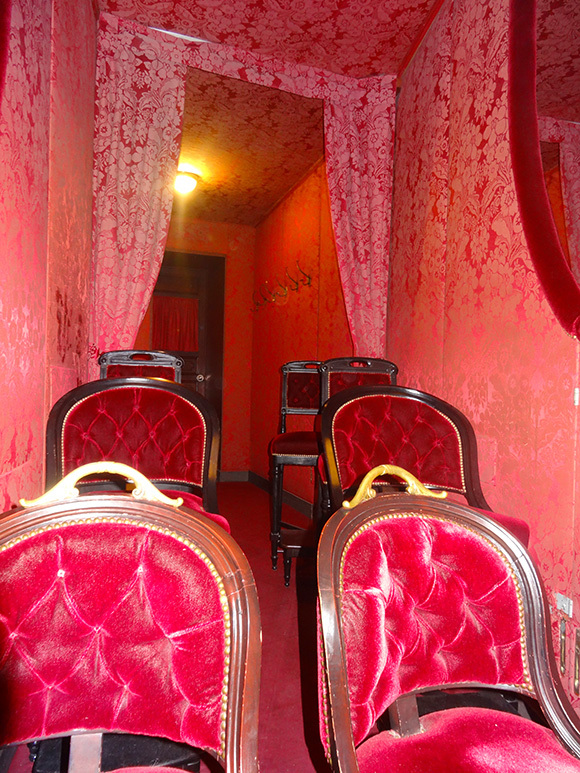 It is said he also built an apartment for himself BENEATH the Opera "Palais Garnier". He was no longer the deformed child that had suffered cruelly. He now was a gentleman who wore a mask to hide his deformed face. He also wore a dress suit, a cloak and a large felt hat. He was respected and earned enough money to live a comfortable life. Just as in the story the real life Erik had his own personal "Box 5" at the opera house. He even had a hollow column built next to it where he could come and go without being seen. 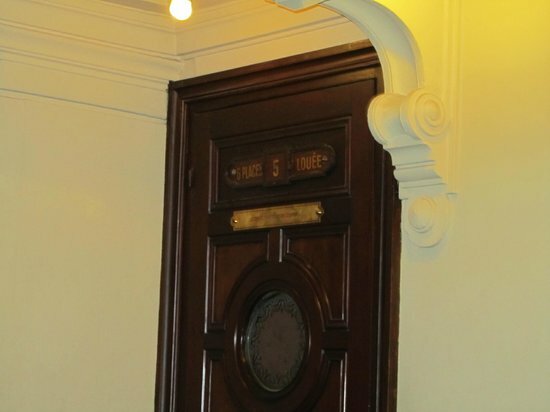 The following photos are of the actual "Box 5", on the "Grand Tier" of the "Palais Garnier", that both the "Real Eric" or "Erik" and Gaston Leroux's "Erik" were suppose to have. The opera house has actually placed a plaque on the door to commemorate its notoriety. More to the Gaston Leroux story is that there actually was a female singer that this real Eric fell in love with and kidnapped for three days. Shortly afterwards she left Paris and "No" she was not named Christine. Here legend further confronts reality. Supposedly heartbroken Eric walled up the door to his small apartment, disappeared and died. When an extension to the Opera House was being built called the "Opera Bastille", not to be confused with the opera house started in 1994 of the same name, the skeleton of a man was found wearing the same ring known to have been worn by Eric. I made the acting-manager put this proof to the test with his own hand; and it is now a matter of supreme indifference to me if the papers pretend that the body was that of a victim of the Commune. The wretches who were massacred, under the Commune, in the cellars of the Opera, were not buried on this side. "La Commune de Paris (The Paris Commune)" was a radical socialist government that ruled only in the city of Paris from March 28 to May 28, 1871. They were created as a result of the chaos after the defeat of Napoleon III in September 1870, during the start of the Franco-Prussian War, and the rise of the "Third Republic" during a four month period. When Prussia laid siege to Paris itself. The War had ended on January 28, 1871. However, "La Commune" refused to accept the authority of the new French government. The French Army was able to suppressed the "Commune" during the week starting May 21, 1871. To French historians that seven day period became known as "La semaine sanglante (Bloody Week)", because of all the killings. According to Gaston Leroux the "acting-manager" claimed the body, which Leroux said was that of the "Real Erik", was killed during "Bloody Week". This would mean Leroux's "Real Erik" died no later than May 28, 1871. 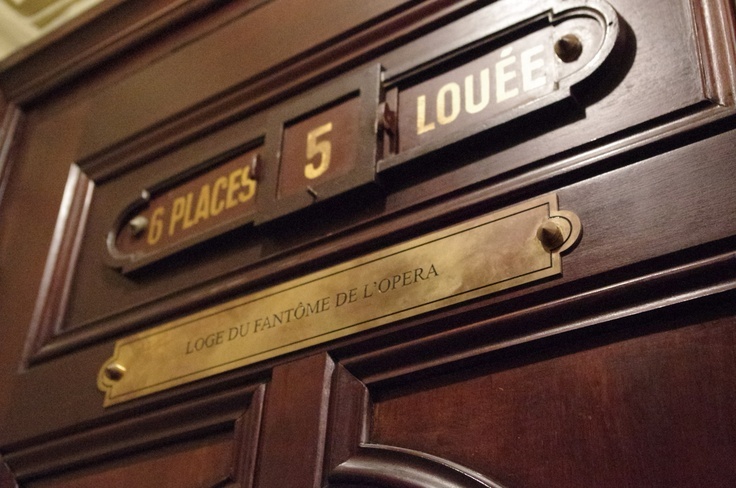 Yet, the story of "Le Fantome de l'Opera" takes place more than 19 years later in the 1890's. Another problem is that if that body was the "Real Erik". It does not conform with the fact he was suppose to have worked throughout the construction of the opera house and the kidnapping occurring later. We know the construction was suspended during the Franco-Prussian war and resumed afterwards with the "Palais Garnier" finally opening in 1875. So a question any reader of Gaston Leroux's "Prologue" must ask themselves. Why he even brought up what he alleges the acting-manager said. Was there a Real Christine Daae? Her last name was not "Daae", but "Nilsson" and her first was not "Christine", but "Christina". In the future she became Christina Nilsson, Countess de Casa Miranda. However, she always signed her correspondence as "Christine". Both Christine's were Swedish with blue eyes and blonde hair. Both Christine's were born poor and both had a patron who paid for their vocal training. Both came out of the chorus to become a major operatic star. Both had a rival in a known Spanish born Diva. 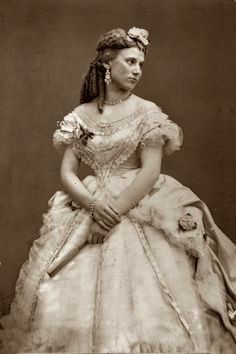 In the case of Christine Nilsson it was Adelina Patti seen in the following photo. Both sang in Paris in the Opera "Faust". Although the real Christina never sang at the "Palais Garnier". For some unknown reason she was to have sung there, but on the day she was scheduled stated she could not. Both would fall in love with a Count. For "Christine Daae" with "Vicomte Raul de Chagny" for the real Christina Nilsson. He was her second husband Angel Ramon Maria Vallejo y Miranda, Count de Casa Miranda in 1887. Maybe not an opera house chandelier falling on her audience, but the real "Christine" had a similar real life incident. 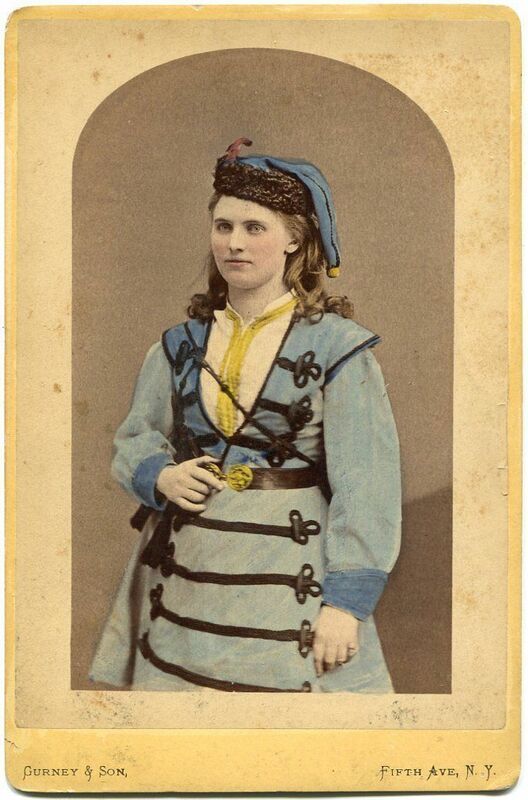 In 1885 Christina Nilsson was considering retiring from the opera and was to give a farewell concert on the balcony of the Grand Hotel in Stockholm, Sweden and the word spread. There was a building near by with an excellent view of the hotel's balcony, but it was under repair with scaffolding running up one side. People started to gather on the scaffolding putting more and more weight upon it. It was estimated that including those going onto the scaffolding the crowd in front of the hotel numbered 50,000. Suddenly a rumor started to spread that the scaffolding was collapsing and panic went through the crowd. When things settled down 19 people had died and many others injured. So now you have the information that was available to author Gaston Leroux. The very basic story is known to all even if my reader has never read the novel. It is set in France during the 1890's. 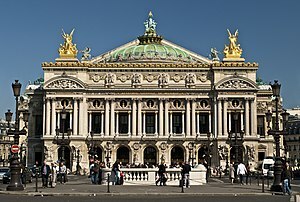 The "Palais Garnier" opera house is suppose to be haunted by a "Ghost", or "Phantom". "Erik" falls in love with "Christine Daae" as he teachers her, unseen, to sing. "Christine" becomes the under study for the diva "La Carlotta". "Erik" initially makes the diva seem to "Croak" in front of a packed house. In reality he is using ventriloquism. "Christine" goes on instead to great applause, but "Carlotta" returns and the girl is back in the chorus. "Erik" starts to take action including the falling chandelier. 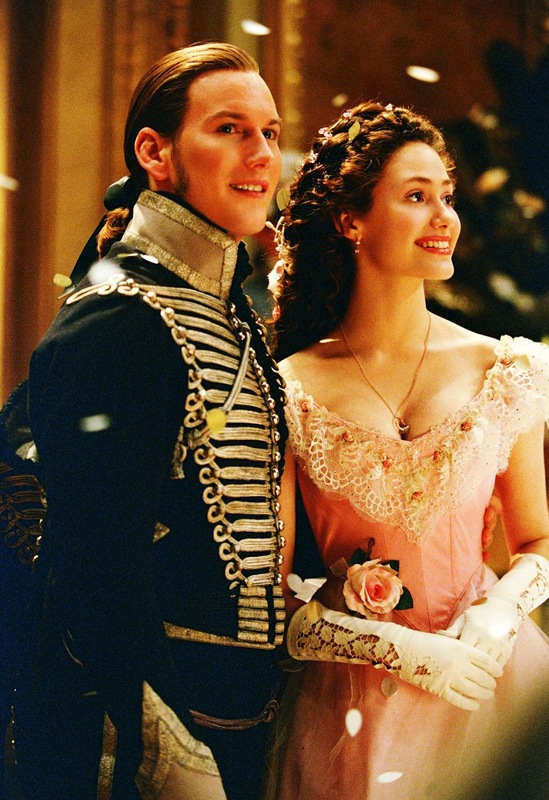 However, the girl is still in love with her childhood playmate "Vicomte Raul de Chagny". 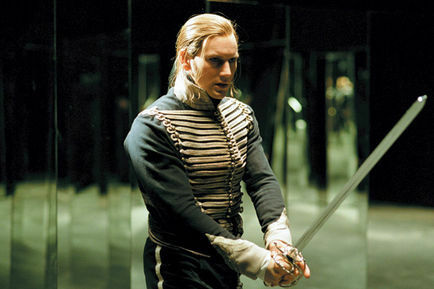 "Erik" in jealousy over the "Vicomte" and wanting "Christine" for himself kidnaps her. "de Chagny" pursues and is captured and tortured. There are some chapters, including the final one, which are narrated by a person called "The Persian". It is his narration that piece together who "Erik" was and it is that last narrated chapter that interests us more than any other. With very minor changes Gaston Louis Alfred Leroux's "Erik" is the "Eric" of the story I have told above. So where does FACT MEET FICTION in a novel the author claims to be based upon a true event? 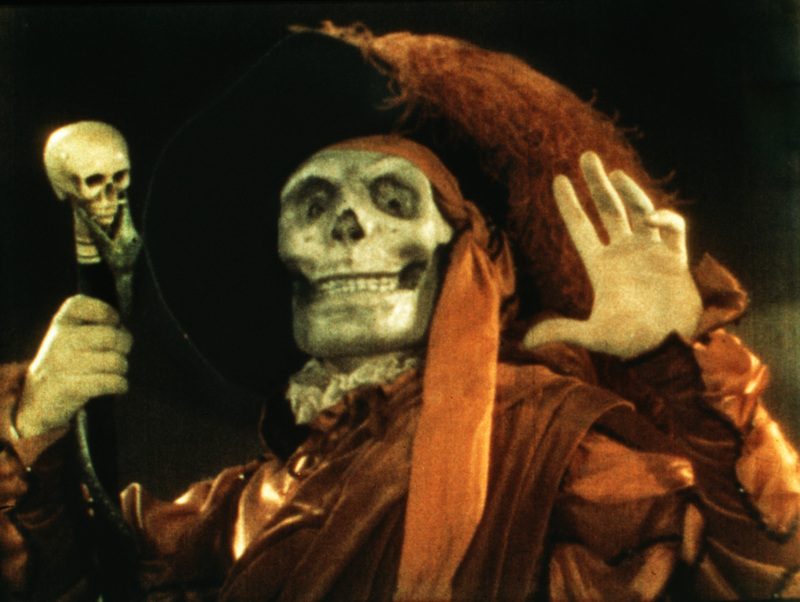 Ask the question: What Was The First Filmed Version of "The Phantom of the Opera"? The answer is always the 1925 feature starring Lon Chaney, Senior, BUT you would be wrong. In 1916 there was "Das Gespenst im Openhaus" made in Germany. Although there appears to be no stills, or footage from the picture. We do know who acted in the photo play. The picture starred Swedish actor Nils Chrisander as "Erik". Norwegian actress Aud Egede-Nissen as "Christine". My reader can go to a website entitled "Classic Horror Film Board" for a very interesting chat on this 1916 film. Including the rumor that Gaston Leroux was a technical adviser. 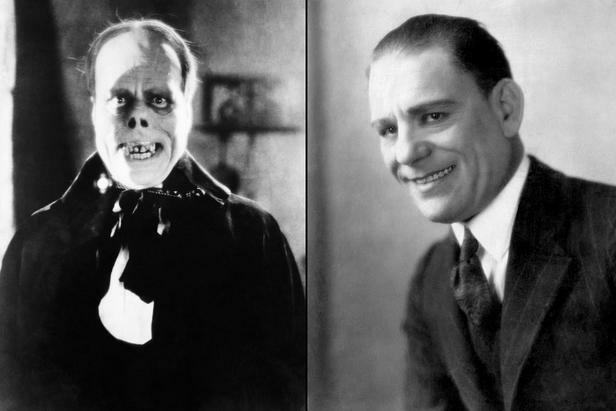 Perhaps the definitive "Erik" was portrayed by Lon Chaney and remains the most recognizable of his "Thousand Faces". Having been given the "Green Light", after his make-up creation for 1923's "The Hunchback of Notre Dame", to create any look he wanted. Should you read the words of Gaston Leroux and compare them to Chaney's "Erik". You would know he is the closest to what the author envisioned. Mary Philbin was "Christine Daae". 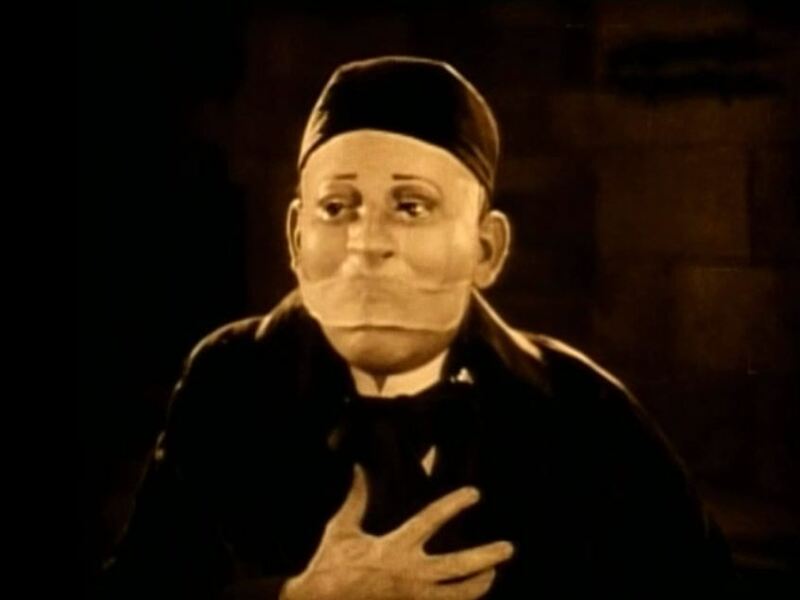 Philbin would portray a similar role as "Dea" in Universal Studio's 1928 production of another French author Victor Hugo's novel "The Man Who Laughs". The title character was portrayed by Conrad Veidt known for the somnambulist "Cesare" in 1922's "The Cabinet of Dr. Caligari". He would also portray the wizard "Jaffar" in 1940's "The Thief of Bagdad". Which became the same named character in the Disney animated "Aladdin". In this motion picture Conrad Veidt was "Gwynplaine" seen below with Mary Philbin. Movie critics of the period considered both Philbin films to be played as a "Beauty and the Beast" scenario. 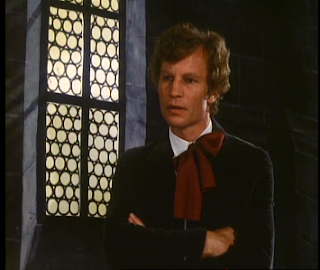 Norman Kerry had the role of the "Vicomte Raoul de Chagny". Kerry had already been seen with Lon Chaney in 1923's "The Hunchback of Notre Dame". He would again be seen with Chaney in director Todd Browning's 1927 silent horror film "The Unknown" co-starring Joan Crawford. Arthur Edward Carewe was "Ledoux the Persian". The character actor had been in films since 1919. After this picture he would appear in the original 1927 "The Cat and the Canary"and would later appear in the first all Technicolor Horror movie 1932's "Dr. X" starring Lionel Atwill and Fay Wray. He would follow "Dr. X". with another Fay Wray/Lionel Atwill Horror classic "The Mystery of the Wax Museum" the original version of 1953's "The House of Wax". This motion picture is very close to Gaston Leroux's original novel. The feature created some specific sequences that would be required to be seen in future productions including Andrew Lloyd Webber's now classic 1986 musical version. However, making that 1925 feature was not an easy shoot and most of the blame went to director Rupert Julian. 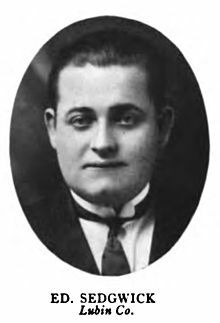 Between 1914 and 1930 Julian directed 60 feature films. Between 1913 and 1928 he was an actor in 95 feature films. 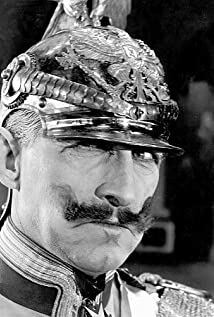 The following still is of Julian as the German Kaiser in the 1918 film "The Kaiser: The Beast of Berlin". According to the director of photography, Charles van Enger, Lon Chaney and other cast members were having problems with director Rupert Julian. Their problems put pressure upon the filming crew as well. In Los Angeles on January 7 and 26, 1925 the motion picture was previewed. The film received poor marks at the preview screening from the audience and critic reviews were very bad. Julian was instructed to reshoot the majority of the motion picture as Carl Laemmle, the studio owner, and others feared a "Gothic Melodrama" would not recoup the cost of production. The reshoot began and before it was completed Rupert Julian walked off the set. 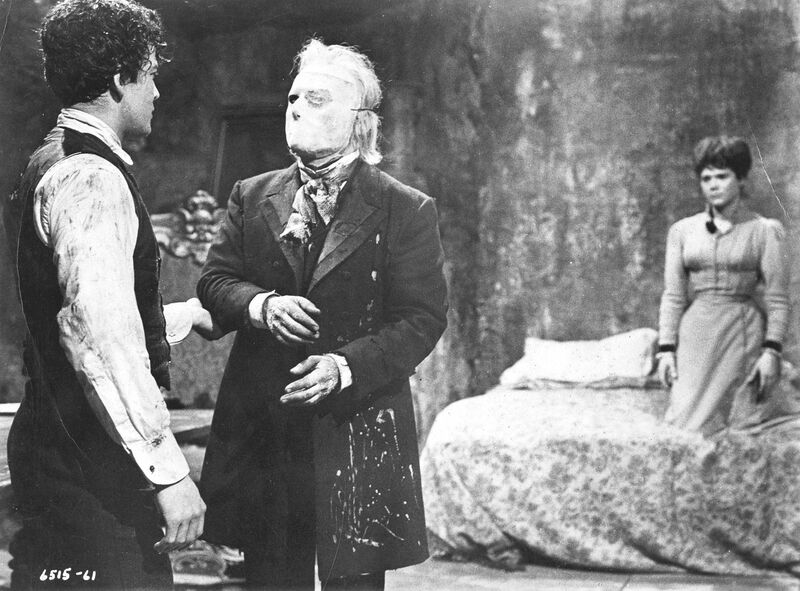 Edward Sedgwick was hired to continue to reshoot the second version of "The Phantom of the Opera". He would go on to direct Buster Keaton's 1928 classic comedy "The Cameraman" among other works. Edward Sedgwick changed the tone of the picture from a dramatic thriller into a comedy melodrama. 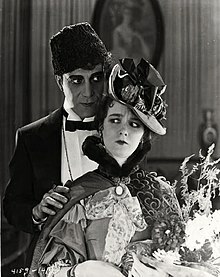 Sedgwick would hire Viola Vale to provide comic relief as "Christine's" maid and Ward Crane to portray, "Count Ruboff", another suitor that had a duel with "Raoul". Both actors scenes were completely removed for the general audience release. Additionally Chester Conklin was also hired for comic relief and saw his scenes cut. Those removals occurred after the San Francisco preview on April 26, 1925 that included booing from the audience. 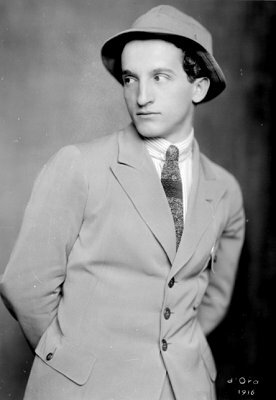 and Carl Laemmle's nephew Ernest took over. Above a rare photo of Lon Chaney, Sr. as he actually looked without one of his "Thousand Faces" and below Ernst Laemmle. The following still is of the "Grand Chandelier" before it falls. Below the chandelier has fallen and people are trapped in panic. In his novel Gaston Leeroux gives "O.G. ", the "Opera Ghost", a specific motivation to drop the chandelier. "Mme. Giry" the Concierge for Box Five was fired by the new owners of the Opera House. He wants her reinstated and is refused. 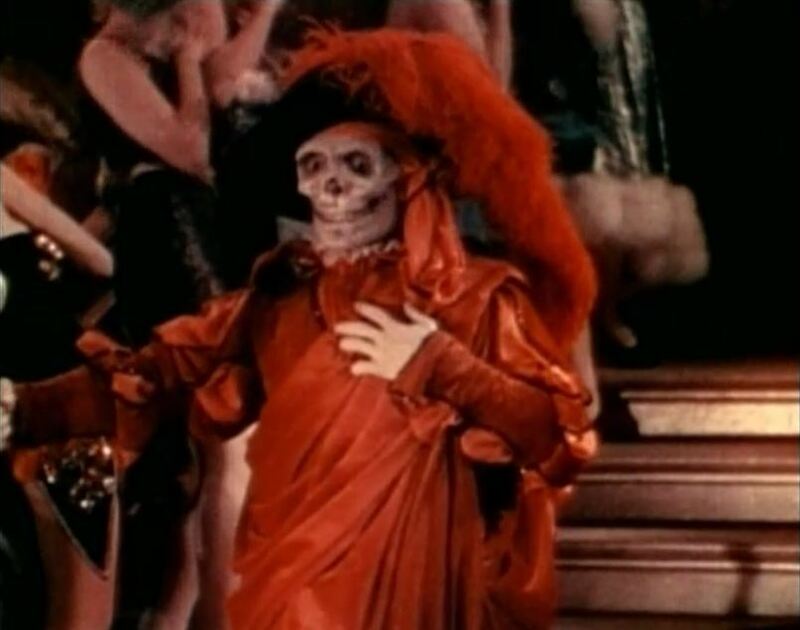 The motion picture had a classic Two-Strip Technicolor sequence with Lon as "The Mask of the Red Death" entering the masquerade ball. When this cut of the picture previewed on November 25, 1925 it had a running time of 107 minutes at select theaters. The general audience release ran four minutes shorter with five scenes deleted at 103 minutes. In 1930 with the advent of sound Universal Studios released a partly re-dubbed sound version of the film with voices added. 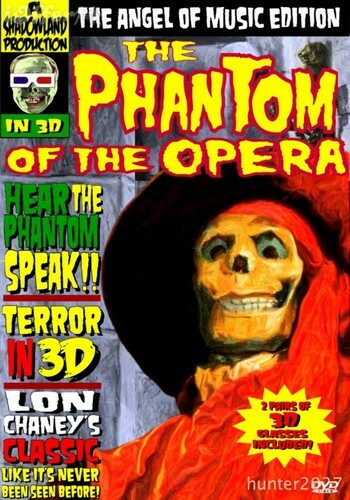 This feature ran only 93 minutes and "The Phantom's" voice was not that of Lon Chaney, Sr. It should be noted that after all the problems and reshoots the final release of the Universal Studio's feature brought in two million dollars at the box office and the largest profit, yet, on a Lon Chaney motion picture. Did I mention that you could see a double feature and a newsreel for 25 cents in 1925? In 2003 "The Milestone Collection" released an excellent DVD set which I have. The set contains the restored 1929 re-release of the full length 1925 preview feature. Along with both the General Audience release of "The Phantom of the Opera" and the 1930 sound version. A must for "Phantom" fans. In 1935 Universal Studio's announced a remake of "The Phantom of the Opera". The story would be updated to modern Paris and the "Phantom" would be a scared World War One French soldier. It wasn't made and in 1941 another idea came into being. Director Henry Koster was brought on board and he immediately put the idea of a returning French soldier aside. 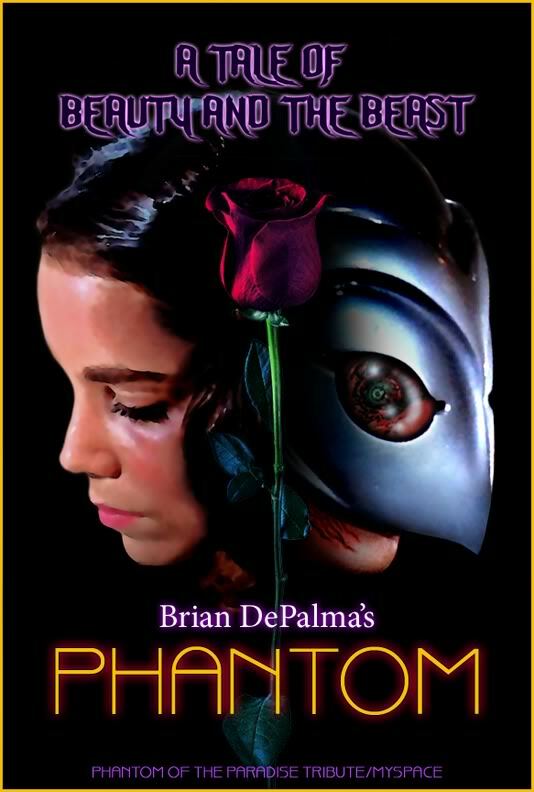 Koster returned the story to the 1890's, but came up with the idea that the "Phantom" was actually "Christine's" father, but she doesn't know this. When the motion picture finally went into production for a 1943 release. Screenplay writer John Jacoby left that idea in the final version, but the scene that would have confirmed that fact was cut from the final release print. However, there are enough clues in the reminding story that leads a smart viewer to that possible conclusion. The clues revolve around a song "Christine" heard as a young girl that is the theme music for the picture. Casting for the production began and Lon Chaney, Jr. asked the powers to be for the title role. The powers to be at Universal Studios didn't even consider the idea of having Lon Chaney's son reprise his father's role. In my opinion the publicity alone would be worth giving him the part. The actors that were considered for not "Erik", but "Erique Claudin" started with Cesar Romero. Who was followed by Boris Karloff, Russian actor Feodor Chaliapin, Charles Laughton and even Broderick Crawford. In the end none of these actors were given the role. 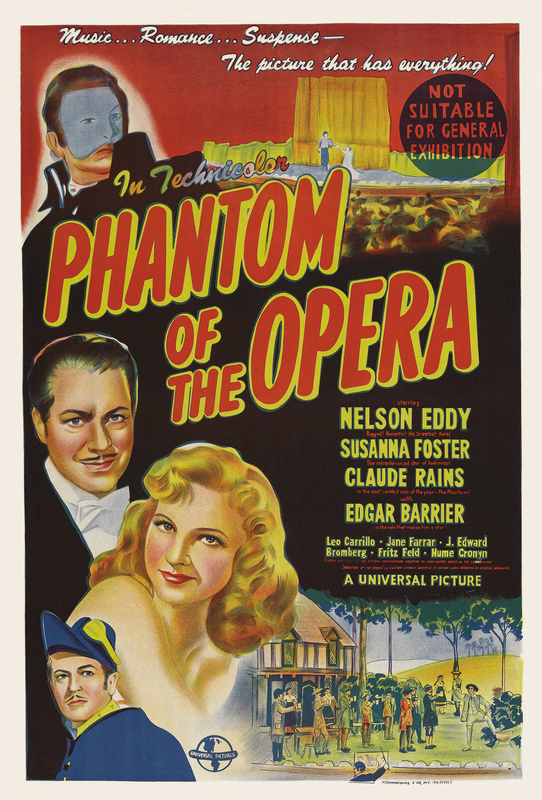 The new Universal "Phantom of the Opera" went to Claude Rains who had third billing behind Nelson Eddy and Susanna Foster. Instead of building the story around Claude Rains's "Phantom" as would seem the right approach. The film was used as a come back picture for Opera singer Nelson Eddy as one of "Christine's" suitors "Anatole Garron". 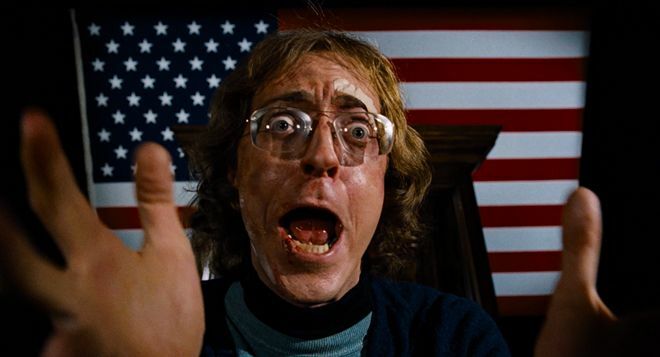 The role gave Eddy's slowing down career a needed boast with some excellent sequences recreating actual opera's. Which take up a lot of the running time. The role of "Christine" brought Susanna Foster out of the chorus and minor roles in a few forgotten "All Star" musicals. The fourth name on the above poster was Edgar Barrier as "Christine's" other dueling suitor Police Inspector "Raoul Dubert". 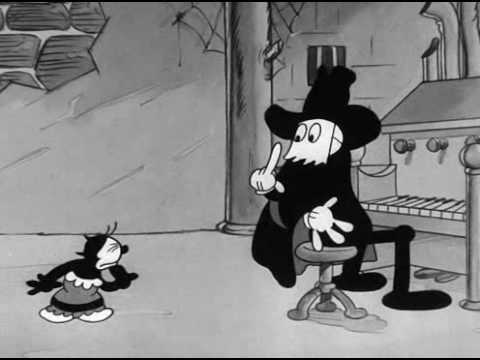 Eddy and Dubert's rivalry for Foster provides many typical comic scenes and helps to distract along with the operatic sequences from any suspense the film might have kept. 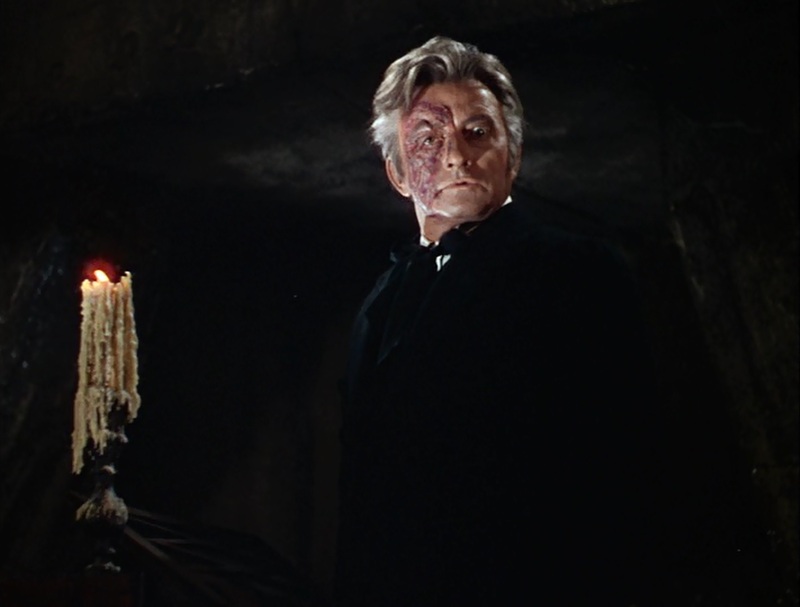 Claude Rains is perfect in his role, but is like a second thought to the script as compared to the comic touches. Above Barrier, Foster and Eddy in a staged publicity still. 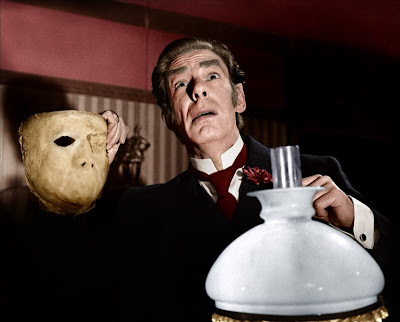 Below Claude Rains as "Erique Claudin" and the "Phantom". I like the look of the mask. 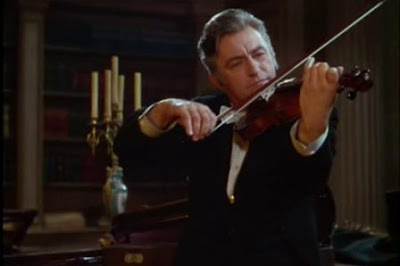 The plot has "Claudin" as a violinist in the orchestra for the "Palais Garnier". "Claudin" has developed arthritis in his hands and is told he is to be pensioned off. This poses a problem as the violinist has been paying for singing lessons for "Christine DuBois" as an unknown benefactor. The lessons will now end, but "Claudin" has hope that his concerto sent to a publisher will bring him fame and money. "Claudin" goes to the publisher who claims not to have ever heard of him. However, the publisher has stolen the concerto and placed his own name upon it as composer. As the two start to argue from another room "Claudin" hears his concerto being played. In a rage he attempts to destroy the plates for the stolen work. A women and lover of the publisher confronts him and throws what she thought was water at "Claudin's" face. In reality it is acid and the "Phantom" is born. Murders begin and "Anatole" is blamed as they seem to relate to those who are stopping "Christine's" career. Below the "Phantom" cuts the chandelier loose. 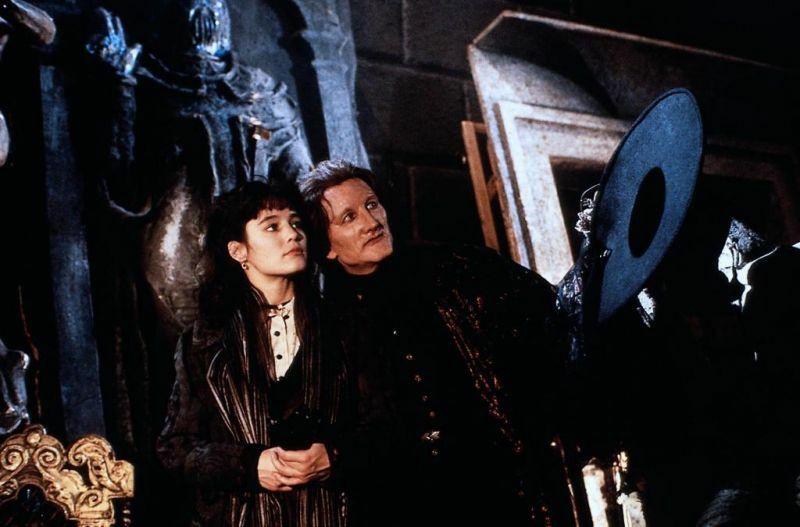 A plan to capture the "Phantom", now identified as "Claudin", is set in motion, but it results in the girl being taken to the catacombs below the opera house. The rescue starts by both "Anatole" and "Raoul". Below the Unmasking of Claude Rains. 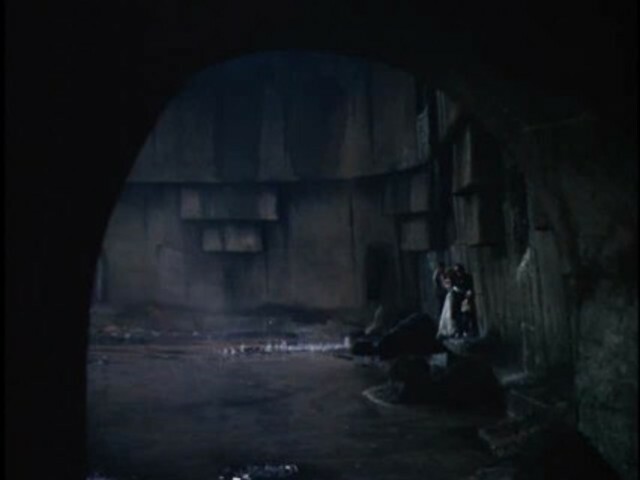 The film ends with "Christine" being saved and the ceiling of the catacomb "Claudine" now lives in collapsing upon him. In the initial cut the audience sees a slight movement and is left with the possibility that "The Phantom" lives. A sequel was planned, but never made. Instead it was reworked into the picture "The Climax" starring Susanna Foster and Boris Karloff in 1944. Over all the critics, at the time of the pictures release, thought as I do. The film just didn't scare, or really thrill you and had too much comedy. 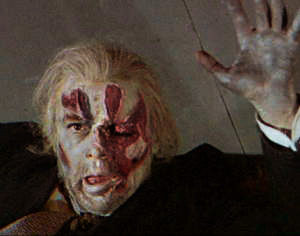 From Claude Rains' third position in 1943 to first position in 1962 was "The Phantom" portrayed by Czech actor Herbert Lom. The picture starts out with the "Phantom" lurking in the underground catacombs of the London Opera House in 1890's England. In a backstory the audience will learn that "The Phantom" was once a music teacher named "Professor Petrie". 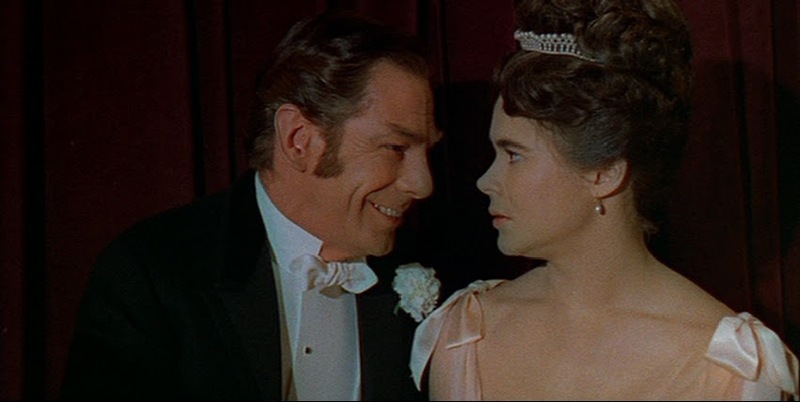 He wrote an entire opera, the concerto in 1943 is part of an opera also, that was given to a publisher "Lord Ambrose Darcy" portrayed by Michael Gough. As with Claude Rains the publisher steals the work and places his name on it. A slight change from 1943 has "Petrie" break into "Darcy's" publishing office, discover what was being done and accidentally start a fire. Wanting to put it out he picks up what "Petrie" believes is water and, from a splash back, his face is hit with acid. 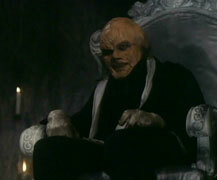 "The Phantom" is born and runs into the sewers were a "Dwarf", played by Ian Wilson, finds and cares for him. The singer in the story is "Christine Charles" portrayed by Heather Sears.She falls in love with the co-manager of the Opera House "Harry Hunter" portrayed by Edward de Souza. Above Sears and de Souza. Below Sears and Gough. "Lord Darcy" promises to help "Christine's" career, if she will give him "certain favors". She had been warned about "Darcy" by a "Phantom" voice in her dressing room. When "Christine" returns home she is frightened by the "Dwarf" and faints. When she awakes she is with "Professor Petrie". He explains he only wants to help with her singing. Meanwhile "Harry Hunter" has discovered the "Phantom's" whereabouts and as he approaches the "Dwarf" attempts to kill him, but only to protect the "Professor" and "Petrie" intervenes. It is at this point that all four become friends and agree to let the "Professor" coach "Christine". The audience learns the backstory of "The Phantom" as "Harry" asks "Professor Petrie" how he came to be there..
As a result of their meeting and understanding. "Professor Petrie's" opera is to be performed with "Christine" in the lead. 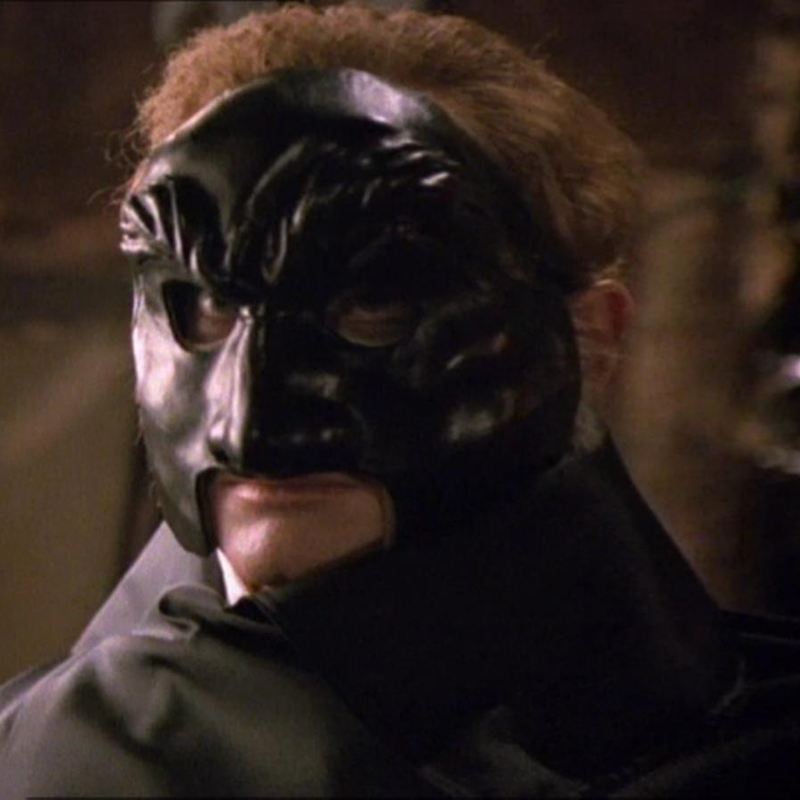 Before it starts we see "The Phantom" enter "Lord Darcy's" office and his Lordship makes the mistake of removing the mask. 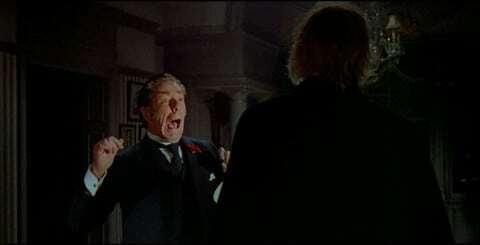 The shock, the audience does not see Herbert Lom's make-up, is too much and "Lord Darcy" runs screaming into the streets of London. In the rafters above the stage the "Dwarf" is watching and enjoying the opera. He is spotted by a stage hand and chased as an intruder by mistake. "Petrie" is watching the opera from a private box when he sees the "Dwarf" jump onto the chandelier. The added weight starts to bring it down and it will fall upon "Christine". "Professor Petrie" pulls the mask from his face, jumps from his box, pushes her out of the way and is crushed by the chandelier. It would be another 27 years before an actual film based upon Gaston Leroux's novel appeared on motion picture screens. By this time Andrew Lloyd Webber's 1986 musical was breaking world wide records and there had been a 1983 television version of the novel. Which I will discuss in another section of my article. 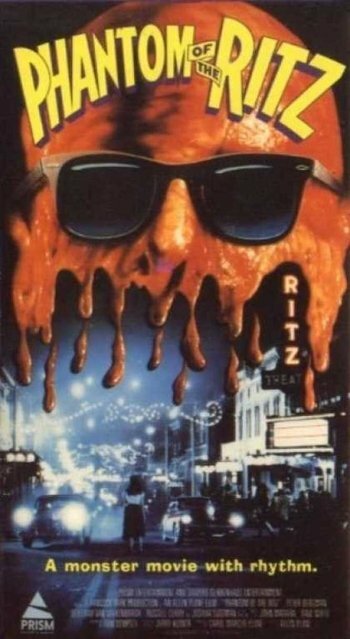 So the timing was right for the big screen once more, On November 3, 1989 this new version went back to the novel for its source, but added three interesting touches that made it stand out for pure horror fans of that year. The other main lead was portrayed by Jill Schoelen and her name is "Christine Day". A nice play on Gaston Leroux's heroine's name. The feature opens with two young women going through a New York Library's sheet music sections to find just the right piece for "Christine" to use at an audition. She stumbles upon part of an opera entitled "Don Juan Triumphant" by "Erik Destler". "Christine" starts to hum and then sing the haunting melody. For those who have never read Leroux's original novel. The composition "Don Juan Triumphant' is the opera "Erik" has been working upon for years and it has a power over "Christine Daae". "Christine" goes to the audition and starts to sing "Don Juan Triumphant" and suddenly something drops from the catwalks above hitting her. The scene starts to blur and the young girl is transported back to the 1890's and the story of the "Phantom" begins as Gaston Leroux pretty much wrote it. 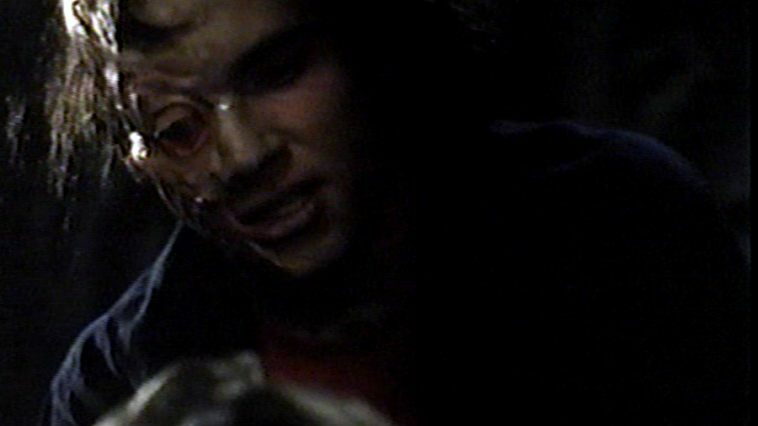 Robert Englund's phantom sews human skin onto his face to form his "Mask". The main part of the gore. We learn that "Erik" sold his soul to the devil so that people would love his music. His face is disfigured so that nothing but his music will be what people remember him for. 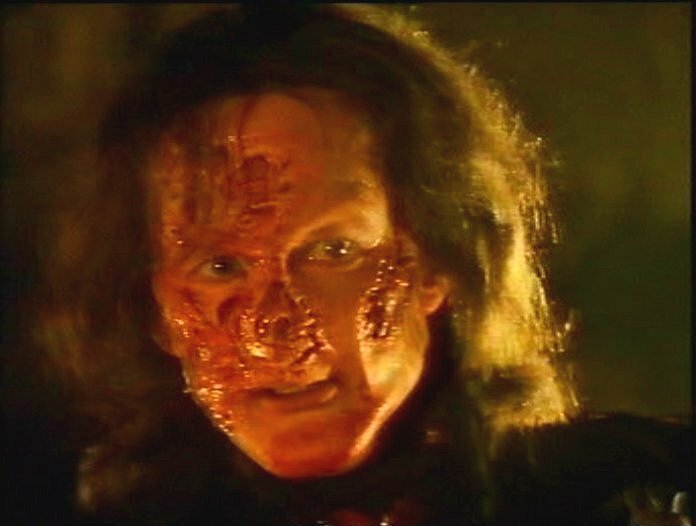 Below Englund as the "Red Death". There is a fire started in "O.G. 's" underground home when Christine is rescued by "Martin Barton" played by Bill Nighy. "Erik" is caught in it as the other two start to escape. The fire's heat shatters one of the many mirrors in the "Phantom's" home. As it breaks "Christine" is transported back to the stage where she was having the audition at the film's start. At the end of that same November in Italy on November 30th. 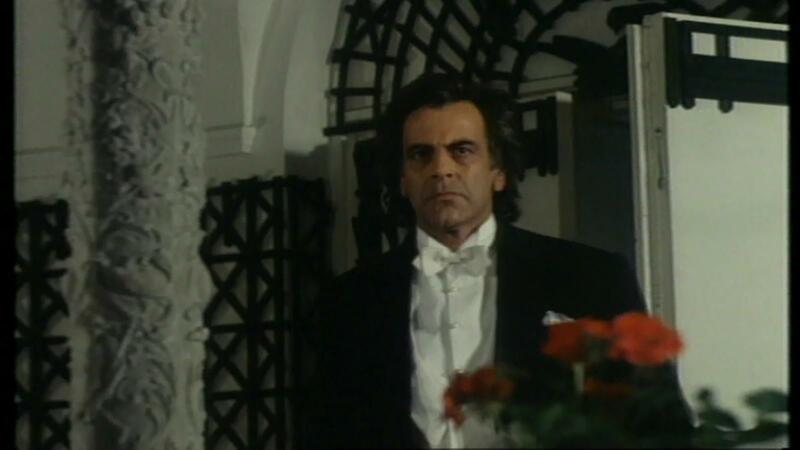 Italian audiences watched the premier of Horror Master Dario Argento's "il fantasma dell'opera (The Phantom of the Opera)". The first change to the novel is that the title character portrayed by Julian Sands is not disfigured. The role of "Christine Daae" is portrayed by actress Asia Argento the director's daughter. Andrea Di Stefano portrayed "Baron Raoul de Chagny"
a gothic kitschfest that leaves no excess unexplored with none of your sanitized Andrew Lloyd Webber treatment here, but plenty of bodice-ripping, lush romanticism, gore and gross antics with rats, all of which should tickle the director's stalwart devotees. However, this "gothic kitschfest" does follow very closely the Gaston Lerous novel and "Variety's" comments indicate how American critics were now influenced by the Andrew Lloyd Webber musical. On December 10, 2004 Andrew Lloyd Webber's musical version of "The Phantom of the Opera" was brought to the motion picture screen in a big way. The screenplay was by director Joel Schumacher and Andrew Lloyd Webber. Schumacher knew how to enlarge the scope of the story on screen also. My reader again probably knows the stage play's story and the songs as well, but does my reader know the casting choices? "The Phantom" ended up being portrayed by Gerard Butler, but he wasn't the first choice. The role was offered to Australian Singer/Actor Hugh Jackman, but he was tied to the filming of "Van Helsing" and had to turn the role down. He described that as a "bummer". In the film's DVD Production notes. Andrew Lloyd Webber explained the type of actor they wanted and why Jackman had been perfect. We needed somebody who has a bit of rock and roll sensibility in him. He's got to be a bit rough, a bit dangerous; not a conventional singer. Christine is attracted to the Phantom because he's the right side of danger. Director Joel Schumacher had seen Gerard Butler as "Dracula" in "Dracula 2000" and was impressed by the actor. He was not a singer and had only four voice lessons prior to auditioning for Webber with "The Music of the Night". :"Christine Daae" ended up being Emmy Rossum, but she was also not the first choice for that role. Katie Holmes was the front runner for the part, but she was replaced by soprano Ann Hathaway. Hathaway had commitments to do "The Princess Diaries 2" and was unable to make the production schedule. She was replaced by Rossum. The only role that was cast without problems was "Viscount Raoul de Chagny" with Patrick Wilson. Patrick was a two time Tony Award nominee and had portrayed "Curly" in the 2002 Broadway revival of Rodgers and Hammerstein's "Oklahoma" that ran for 368 performances. 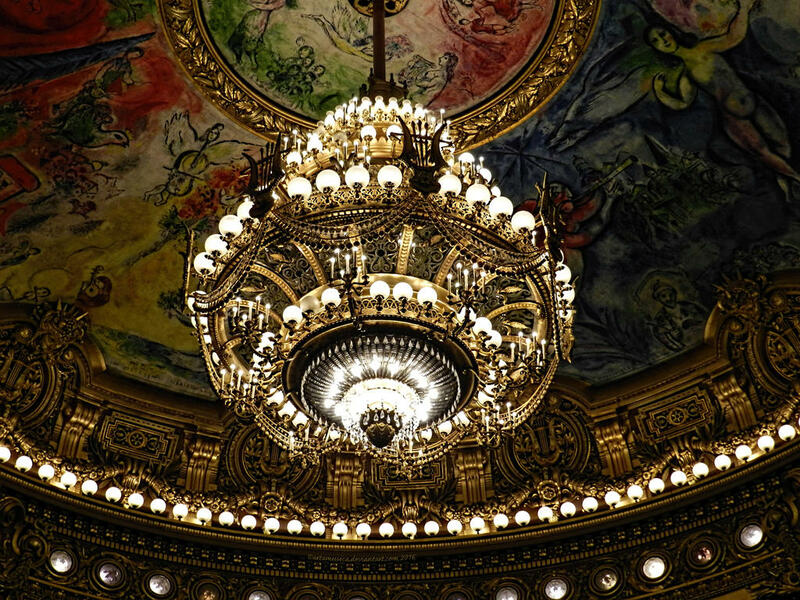 The original play opened with an auction in 1905 Paris and as the chandelier rises. The play now cuts back to 1881 and the story as written by Andrew Lloyd Webber and Richard Stilgoe. The play ends first with "Christine" giving the "Phantom" back his ring and she leaves with "Raoul". The audience sees a weeping "Phantom" for his loss setting in his chair as he pulls a cloak over him. "Meg" and the mob enter and she pulls the cloak away to reveal no "Phantom", but only his mask as the curtain comes down. One of the major changes to the motion picture version deals with the beginning, the middle and the end. At the opening auction being held not in 1905, but 1919. The audience sees the elderly "Raoul" obtaining a box with a monkey that plays a cymbal. We will see him again as he sits in the backseat of his chauffeured car at times throughout the film going somewhere not revealed until the end. When the chandelier rises the story cuts not to 1881, but even farther back 1870. As I mentioned earlier the actual novel takes place in the 1890's. At the film's conclusion the significance of the box with the monkey is known and the audience sees the aging "Raoul" walk to "Christine's" grave site. There he will see a Red Rose which tells us that the "Phantom" is both still alive and still in love with her.. This section looks at how several Film Makers brought their version of Leroux's "Phantom" to the screen. Some for a visit, others to reinterpret the character while paying homage to the original wor. While a few used a variation of the title simply as a lure to get an audience to a picture that had nothing whatsoever to do with the novel. "The Phantom of the Opera" made a guest appearance in the 1930 cartoon "Spooks" starring the Walt Disney created character of "Oswald the Lucky Rabbit"and directed by animator Walter Lantz. Oswald goes to a cemetery and the "Phantom" first appears. A beautiful 1937 reworking of Gaston Leroux's story was "Song at Midnight" by Chinese film maker Ma-Xu Weibang. 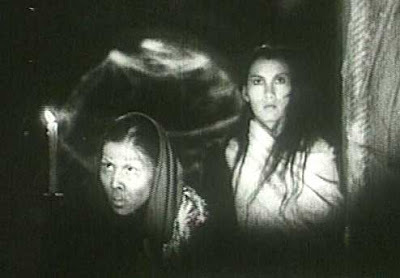 The picture was in Mandarin and is considered the first Chinese horror film. This importance feature was also known as "Midnight Song", "Singing at Midnight" and by the literal translation of the Chinese title "Voice at Midnight". The plot is pure Gaston Leroux about a disfigured musical genius named "Song Danping". He roams a traditional Chinese opera house seeking revenge on those who offend him. This production is considered one of the top 100 Chinese films ever made. The story has reminded very popular in China and was remade four times. The first remake was a two part film in 1962 under the title "The Mid-Nightmare". The second in 1985 under one of the original titles "Song at Midnight". 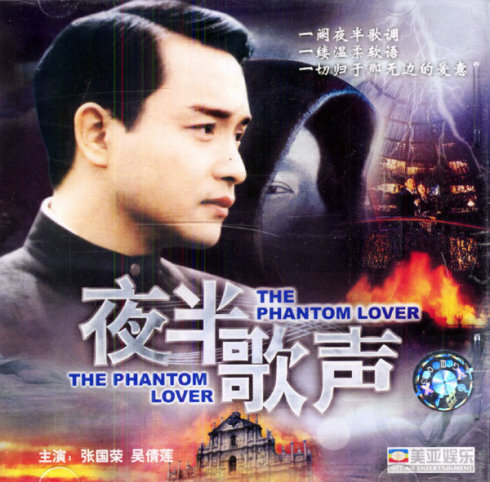 The third remake was titled "The Phantom Lover" and released in 1995. The fourth remake was as a 2005 Chinese television mini-series. It should also be noted that the original director Ma-Xu made a sequel to his 1937 film in 1941. I could locate no information about the film, but it is the only actual sequel to a movie associated with Gaston Leroux's work. In 1955 a movie entitled "El fantasma de la operetta (The Phantom of the Opera)" was released in Argentina. Other than the title the movie has nothing to do with Gaston Leroux's novel and is about a serial killer killing chorus girls who is the "Phantom" of the title. The film is more like either Universal Studio's 1944 "House of Frankenstein", or it's follow up 1945's "House of Dracula". As both the Frankenstein monster and a Wolfman appear. Not to be out done Mexico four years later made a motion picture with the same Spanish language title. The enthusiasm of the waiter Aldo for the young vedette Lucy unleashes a pitched battle between the audience of the cabaret "El Flamboyán" and causes the owner of the place to fire them. Determined at all costs to achieve the triumph of Lucy, Aldo convinces her to try to make a season in the abandoned theater of the operetta. What he does not know is that in the theater a ghost takes refuge that will end up falling madly in love with the young woman. In 1961 "Woody Woodpecker" got into the act with "Phantom of the Horse Opera". Which has nothing to do with Gaston Leroux's novel and everything to do with a "Horse Opera" aka: "Western". The following site speaks to the cartoon, but is in Russian until you translate it. In June of 1964 another dubious rip off title appeared from Italy originally called "IL Vampiro dell'opera (The Vampire of the Opera)" but was changed, because Italians were sick of Vampire movies, to "IL mostro dell'opera (The Monster of the Opera)". A theater troupe's young, energetic leader has secured an old theater in which to produce his new production. The theater's elderly caretaker urges the group to leave at once. A vampire is awakened and discovers that one of the troupe is the reincarnation of the woman who he once loved. In June 1973 what was actually a slasher/comedy was released entitled "Wicked, Wicked".. The film, written, produced and directed by television writer Richard L. Bare, had an interesting gimmick called ""Duo-Vision". Which in reality was a split screen, but used for the entire motion picture. The way Bare uses the technique is reminiscent of Brian De Palma's "Sisters". Once more going to IMBd for a description of this film by alfiehitchie. Which explains the only connection to "The Phantom of the Opera". A tongue-in-cheek psycho movie in "Duo-vision." The entire feature employs the split-screen technique used in parts of Brian De Palma's "Sisters" that same year. As a handyman at a seacoast hotel, Randolph Roberts wears a monster mask while he kills and dismembers women with blond hair. Tiffany Bolling is a singer, Scott Brady is a detective and Edd "Kookie" Burns is a lifeguard. 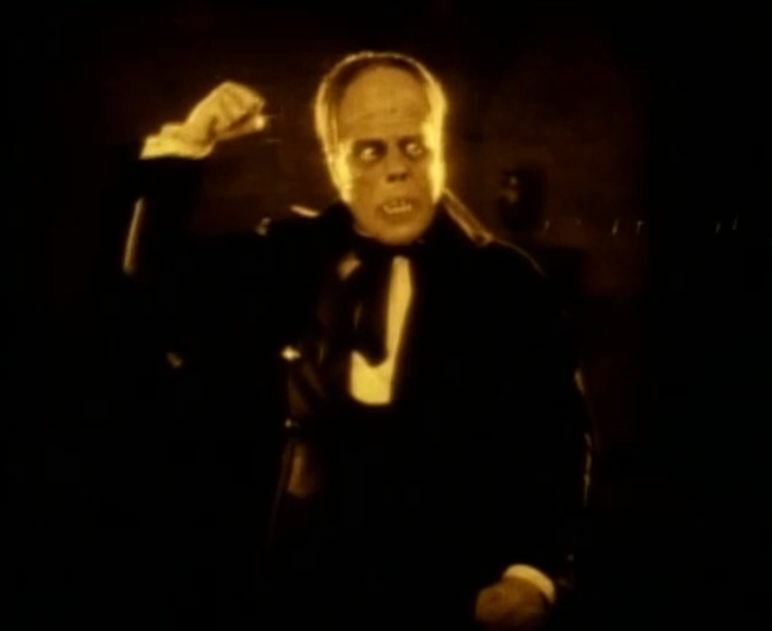 The music is the original organ score for the silent film "Phantom of the Opera." Speaking of Brian De Palma, on October 31, 1974, what is in my opinion the number one reworking of Gaston Leroux's novel with lifts from both the 1943 and 1989 screenplays was released. 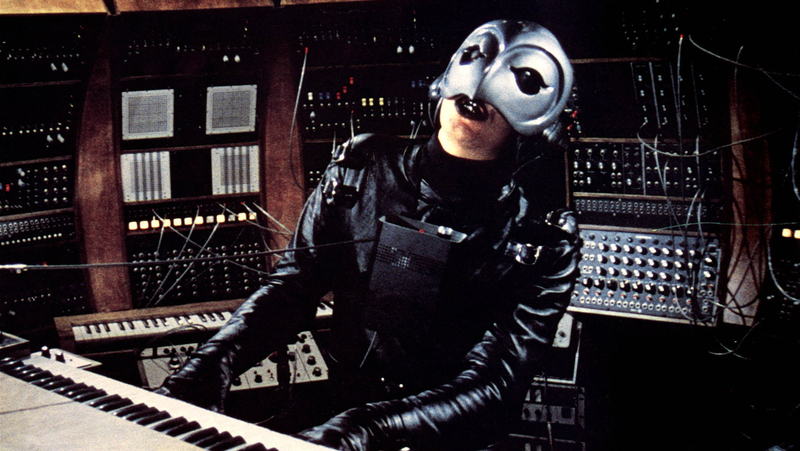 "Phantom of the Paradise" aka: "The Phantom of the Fillmore" is a rock musical with a great score written by and at times performed by composer Paul Williams. However, the real "Beast" in this motion picture is the record producer "Swan" the owner of "Death Records". Also played with pure evil by composer Paul Williams. The screenplay written by De Palma takes the Gaston Leroux story and brings it into the rock culture and fan bases of the 1950's through 1970's. The novel has many references to the 1859 Opera "Faust" as I have mentioned. De Palma uses that story to explain "Swan's" success by substituting him for "Faust". "Swan's" gift from the devil is eternal youth. However, a little Oscar Wilde enters the story/ As there is a tape recording of what the real evil "Swan" looks like. Destroy the tape, and like Wilde's "Dorian Gray" he becomes the face on the tape and dies. 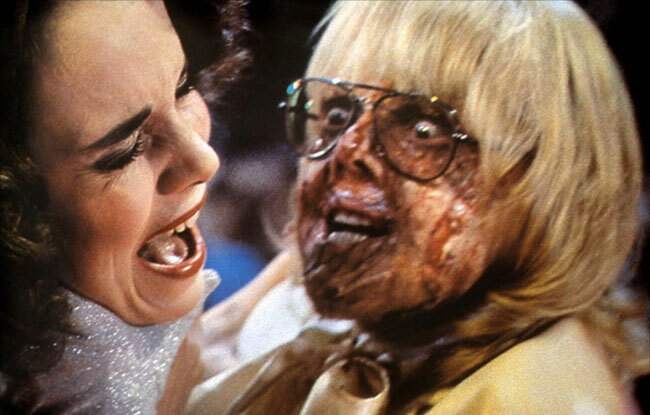 Below Paul Williams with the child like face as the diabolical "Swan". The plot has "Winslow Leach", portrayed by William Finley, taking a composition to Williams. As in both the 1943 and 1962 film "Swan" proceeds to steal it. "Winslow" attempts many times without success to get near "Swan" to find out what happened to his composition. 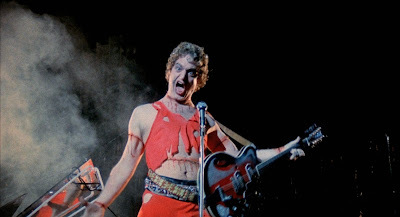 The plot is full of social commentary on "Rock and Roll" fans and bands by De Palma. This is used as the background for his updated "Phantom of the Opera". 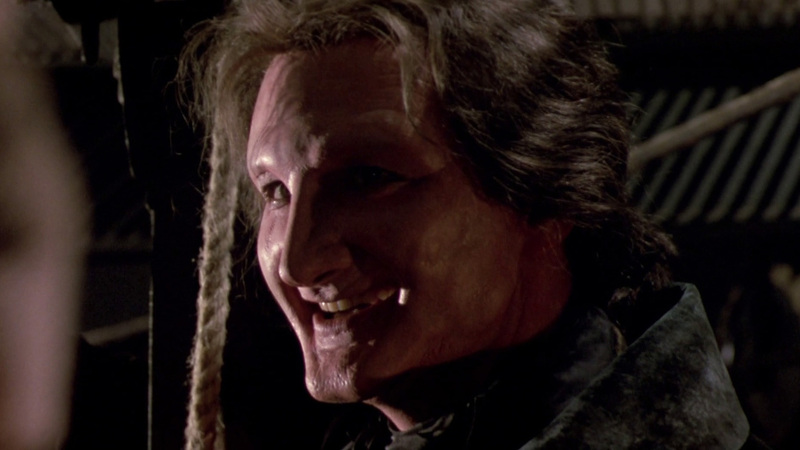 "Winslow", as in the two Universal Studio's releases, discovers that "Death Records" is producing his music as composed by "Swan". He attempts to destroy the records, but gets his head caught in the record press creating the "Phantom the Paradise". The "Paradise" is the new concert hall built by "Swan". The girl in the story is "Phoenix" portrayed by a young Jessica Harper, Dario Argento's 1977 "Suspira" and 2002's "The Minority Report" starring Tom Cruise. Of course "Swan" will make "Phoenix" a star as he attempts to get her soul. "Winslow's Phantom" starts to give "Swan" trouble with some beautifully staged rock and roll style murders. Especially the spectacular electrocution of "Beef" deliciously played by Gerrit Graham. The "Phantom" sends a neon lightening bolt into his body as the teenage audience cheers thinking its part of the show. "Swan" knows "Winslow" is the "Phantom" and sets a trap for him. 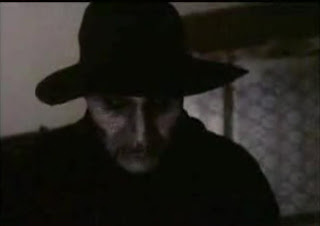 The twist comes that once the two meet the head of "Death Records" wants him to continue to compose music. He is offered a personal contract that must be signed in blood. In the fine print the contract reads that "Winslow" is giving his soul to "Swan". After the deal has been struck. "Swan" uses a sound synthesizer to give the now voiceless "Winslow Leach" a new electronic one. "Leach" now continues to compose and sing, actually Paul Williams, as he searchers for a way to stop "Swan" and save "Phoenix". This all leads to revealing the real "Swan".with an over the top Paul Williams. Having fun going against his own image. On October 30, 1988 at the Fort Lauderdale, Florida film festival. A comedy/rock musical premiered entitled "The Phantom of the Ritz", A man buys an old theater, "The Ritz", and starts putting on 1950's rock and roll shows. One by one there starts a series of accidents killing off members of the cast. 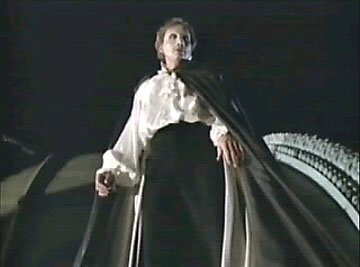 "The Phantom of the Mall" aka: "Phantom Nightmare" was released December 1, 1989. This takes the typical teen slasher movie and reinvents it by blending in the Gaston Leroux classic. "Eric Matthews", Derek Rydall, loves "Melody Austin", Kari Whitman, but there is a suspicious house fire and "Eric" is apparently killed. Over the spot the house stood a mall is built. "Erik" is of course alive and becomes the mall's "Phantom" seeking revenge against those who started the fire and the mall owner. Earlier he saw "Melody" once again shopping and being harassed by the owner's son. Being still in love with the girl he becomes her protector. However, over the time that has passed "Melody" now loves "Peter", Rob Estes. After a streak of revenge murders "Erik" plants a bomb at the mall and at the feature's end. He dies when the bomb explodes as "Peter" saves "Molly" just in time. On July 11, 2003 the motion picture adaption of the comic book series "The League of Extraordinary Gentlemen" was released. 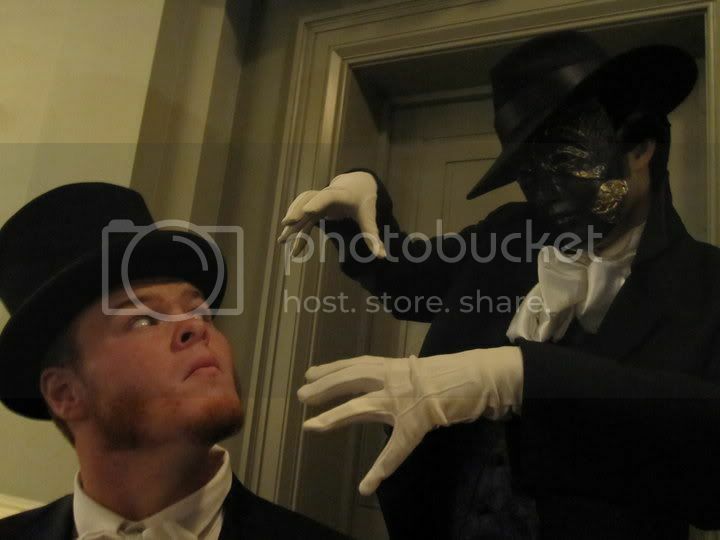 Although one of the "Gentlemen" was a revision of Bram Stoker's "Mina Harker" who is now a good vampire. The "League" is led by Sean Connery as H.Rider Haggard's "Alan Quatermain". As all of the character were classic novel based. 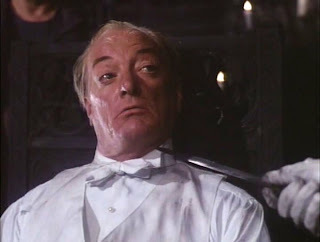 The villain of the piece was actually Sir Arthur Conan Doyle's "Professor James Moriarty"portrayed by Richard Roxburgh. "Moriarty" uses two disguises. The first is as Ian Fleming's "M" and the second is Gaston Leroux's "Phantom", but spelled "Fantom" seen below. Sometime in 2009 a straight to video low budget picture called "Angel of Music" was released. The story was billed as a sequel to the Gaston Leroux novel. It is about a man who believes he is the son of "Erik" as events similar to the original story start to occur. Also his wife "Christine" is discovered to be having an affair with a man named "Raoul". The picture was suppose to have a "Shocking Ending", but as I have never seen it or found a review. What that ending is I have no idea. 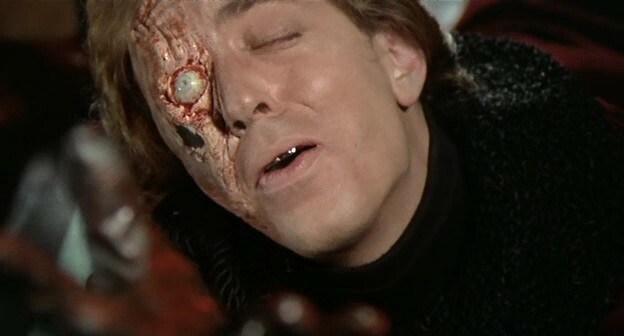 The following year there was another low budget film "Erik: Portrait of a Living Corpse". This is actually a student film written and directed by Ryan Bijan. His film is a dark comedy retelling of the events of the novel, but from "Erik's" point of view. 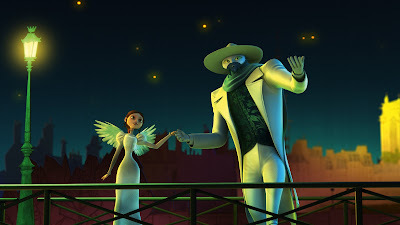 October 12, 2011 saw the release of a French 3-D animated feature "Un monstre a Paris (A Monster In Paris)". The film was produced by Luc Besson ("The Fifth Element) and directed by Bibo Bergeron. The film is set in 1910 Paris and is about a monster who lives not in the catacomb's of the opera house, but a garden and loves a singer. The picture is very loosely based on Gaston Leroux's novel and aimed at children. 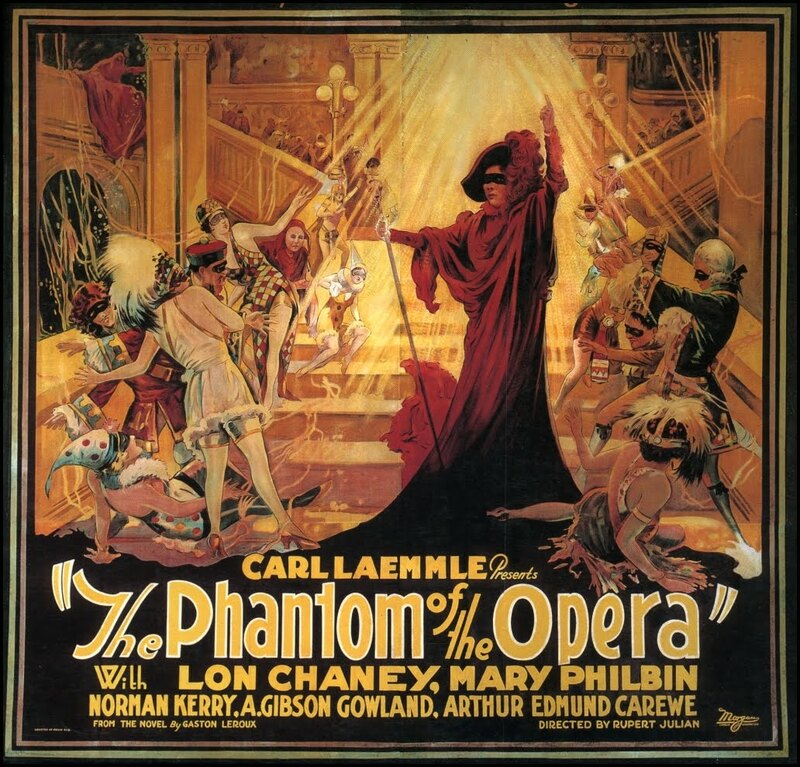 On October 8, 2014 a very low budgeted reworking of "The Phantom of the Opera" was released. It tells of a legend about a disfigured masked murderer that haunted a theater called the "Garnier Opera House". The name lifted from the Gaston Leroux novel, but not the Parisian Opera house. The "Garnier" of this story is now old and deserted. Stories of paranormal activity surrounding the old opera house bring a television crew there to investigate. Of course they reawaken the spirit of the "Phantom: and the murders begin. I have never seen it, or could find a solid review of the film. However, from the character list it appears we have the girl that looks like the "Phantom's" lost love. As actress Savannah Kimmerer portrays both "Christine" and "Charisma". This is her only film apparently. As it seems with many of the actors listed. 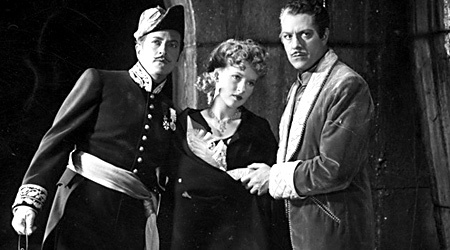 Above is the only known surviving photo from the 1955 mini-series "El Fantasma de la Opera (The Phantom of the Opera)" made for television in Argentina. We know it starred Argentine singer/actress Raissa Bignardi as "Christine Daae", This is also the first known television production of Gaston Leroux's novel. Do not confuse it with the the 1954 Argentine comedy I have previously mentioned. This was a serious adaptation of the work. In 1960 Argentina did another television mini-series based upon the novel. Here is a behind the scenes photo from that production. 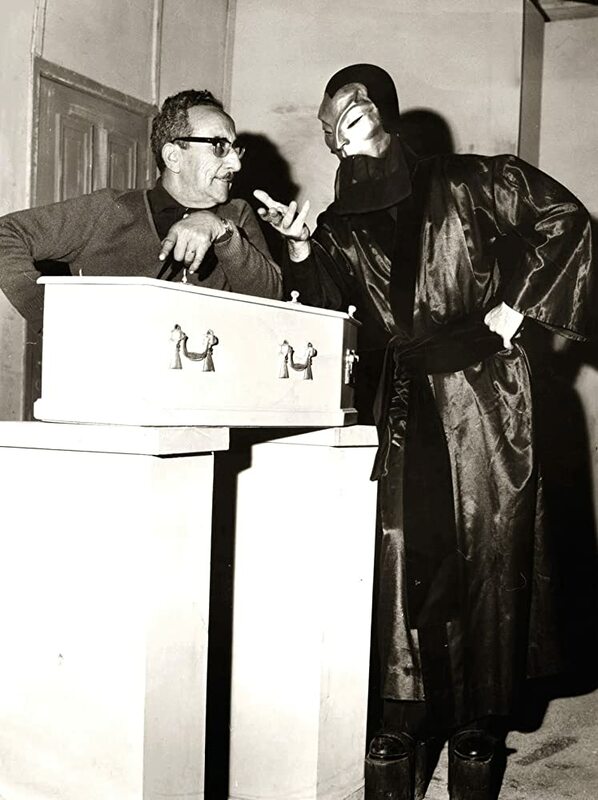 The man in the dressing gown and mask is Narciso Ibanez Menta below. Paris' most feared fiend, the masked Phantom of the Opera, captives a beautiful soprano and brings her to his underground lair. He warns her that she will remain there forever, and that he will tolerate anything except an attempt to remove his mask and reveals what lies beneath. 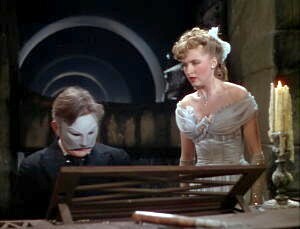 As the Phantom sits down at the organ to play, the prisoner hesitantly approaches him, rips off his mask, and reveals the hideous visage beneath. The Phantom, enraged, starts to throttle her, but there's a ripping sound as he pulls her own human mask away. Beneath is a twisted horrible visage to match his own. Man and woman find their respective soulmates and embrace. Leslie Nielsen portrayed the "Phantom" and Mary Ann Beck was his prisoner. Television audiences, on February 12, 1974, saw a made for TV movie that moved the location from Paris, France to Los Angeles, California . It changed "Erik" into a disfigured actor living on the back lot of a movie studio about to be sold to developers. 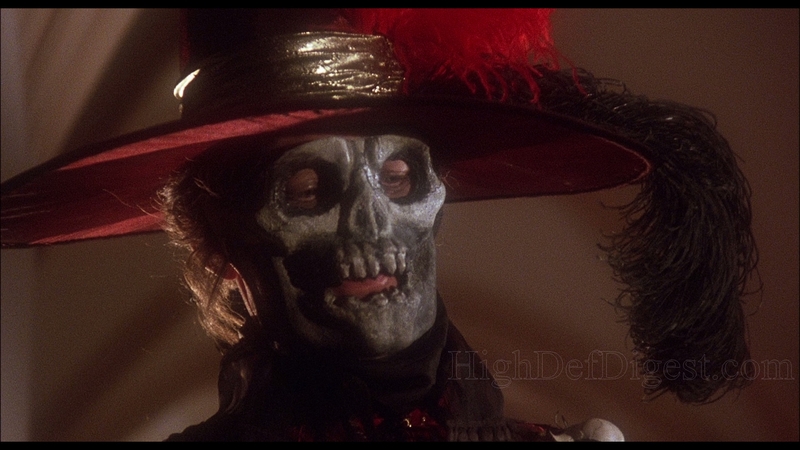 "The Phantom of Hollywood" was played by Jack Cassidy. the father of David of "The Partridge Family", another television program in which he co-starred with his ex-second wife Shirley Jones, not David's mother. 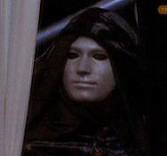 Cassidy's characters were Otto Verner aka: the Phantom and his twin brother Karl. The film feature guest star actors such as Peter Lawford, Jackie Coogan, as a child the title role in Charlie Chaplin's "The Kid" and "Uncle Fester" on television's "The Adam's Family", Broderick Crawford and John Lreland. 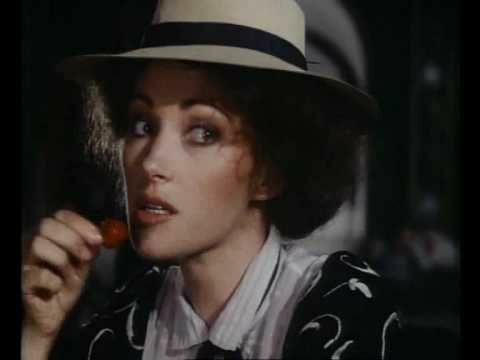 On January 29, 1983 a revised "The Phantom of the Opera" set in Budapest, Hungary, came to television with a slight twist lifted from Bram Stoker as Jane Seymour portrays the dual role of "Elena Korvan" and "Maria Gianelli". The first is the wife of "Sandor Korvan", Maximilian Schell, and her look alike opera singer that the "Phantom", Schell, falls in love with and teaches. 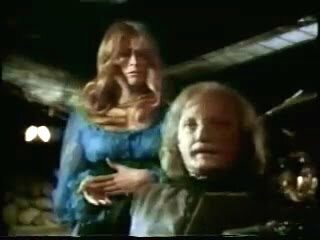 Michael York portrays "Maria's" love interest "Michael Hartnell" the new manager of the opera, if my reader has seen the 1943 version. York's role is very similar to that of Nelson Eddy's to Susanna Foster. The story has the opera theater owner "Baron Hunyadi", Jeremy Kemp, also in love with "Elena", She spurns him for her husbands love and "Hunyadi", like Michael Gough in the 1962 film, has a critic write a terrible review of "Elena". 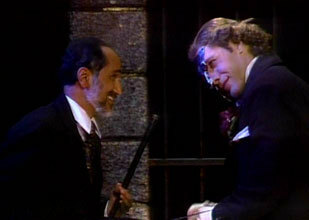 The "Baron" bribes a man to start booing "Elena" as she sings in "Faust". "Elena" becomes so depressed that she commits suicide. Enraged "Korvan" murders the man from the audience and goes to the critic's office. Again in a variation of either the 1943, or 1962 version has "Korvan" struggle with the critic as a fire breaks out. The critic is murdered, but a bottle of sulfuric acid is knocked free from a shelf and falls on "Korvan's" face and the "Phantom" is born. At this point "Maria" enters the story and the plot follows the concept of the 1962 film. 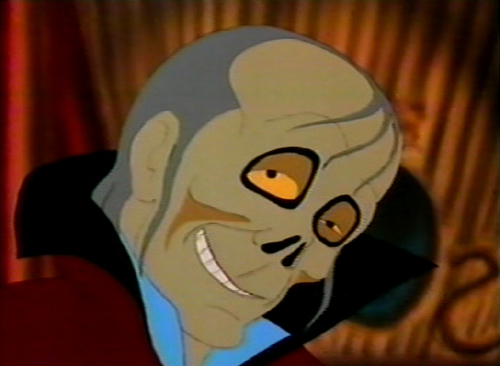 On May 3, 1988 an animated version of "The Phantom of the Opera" appeared on television. It had a running time of 45 minutes For its running time this film covers most of Gaston Leroux's novel. Alvin, Simon and Theodore got into the act on November 25, 1989 with "Phantom of the Rock Opera". According to the website: "Munkapedia". A mysterious person falls from the ceiling during a break of a rock opera the "Chipmunks" are performing in. His name is Lance and he was fired by a singer named Bombingo. Who is envious of Lance's singing. After Alvin is to be replaced by Bombingo he decides to help Lance get even. Saban Entertainment, probably best known for bringing the Japanese series "Kyoryu Sentai Zyuranger" to the United States as "The Might Morphin Power Rangers", in 1993 produced a lavish two part version of Gaston Leroux's "The Phantom of the Opera" for NBC television. It was first shown on March 18, 1990. Portraying "Erik" was British actor Charles Dance who is probably more known today for the role of "Tywin Lannister" on HBO's "Game of Thrones". Teri Polo portrays "Christine". My readers my know the actress from the sixth and seventh seasons of "The West Wing" as "Helen Santos", or the ABC Family Channel program "The Fosters" as "Stef Foster". The screenplay was by Arthur Kopit's based upon his book for his unproduced stage musical "Phantom". The mini-series was directed by Tony Richardson. Whose work includes 1959's "Look Back in Anger" starring Richard Burton, 1960's "The Entertainer" starring Sir Lawrence Olivier, 1963's "Tom Jones" starring Albert Finney, the great 1965 dark comedy about the funeral business, "The Loved One" starring Robert Morse and 1970's "Ned Kelly" starring Mick Jagger. Portraying the "Comte Philippe de Chagny", there is no "Raoul" and "Philippe" is the love interest, was Adan Storke. He is best known for the role of "Larry Underwood" in the 1994 original version of Stephen King's "The Stand" and playing Julia Roberts' love interest in 1988's "Mystic Pizza". Arthur Kopit's book adds a father for "Erik". He is "Gerard Carriere" which adds to the story and the ending. Portraying the role was Burt Lancaster. This story obviously has been re-envisioned and works very well. One of the changes that helps with the dynamic between "Christine' and "Carlotta" is that the Diva is now the wife of the new Opera House Manager. The ending isn't Gaston Leroux's, or for that matter any other versions. It is very romantic and sad. At one point "Erik" talks of his mother with "Gerard". It is in this touching scene that "Gerard" reveals he is "Erik's" father, but apparently "Erik" has suspected this for a long time. A promise is made if "Erik" ever dies, or is at the point of dying. "Gerard" will bury him so deep that no one can put him on display as a freak. For the murders that have been occurring and the dropping of the chandelier on the audience. The police are now in the Opera house waiting for "Erik" to appear. He is below, but starts to hear "Christine" singing and this lures him to "Box Five". He makes his presence known to the audience and the police by singing a duet with the girl. 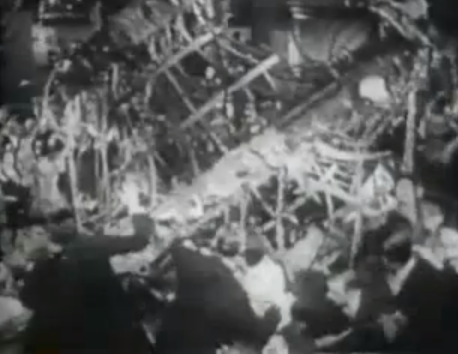 The police start shooting at "Box Five" and "Erik" jumps down to the stage, grabs "Christine" and takes her to the roof. "Philippe" has followed and he struggles with "Erik", looses his stance and starts to fall off the roof, but is being held by "Erik's" grip. "Christine" pleads with "Erik" to save "Philippe" and he does. The police are closing in and want to take "Erik" alive and parade him before Paris to prove the "Phantom" is no longer a threat. "Gerard" arrives on the roof with a pistol. As he promised to protect his son from being turned into a freak show. Very sadly "Gerard" is forced to kill him to save him. "Erik" falls off the roof to the ground. "Christine", "Gerard" and "Philippe" find him dying. 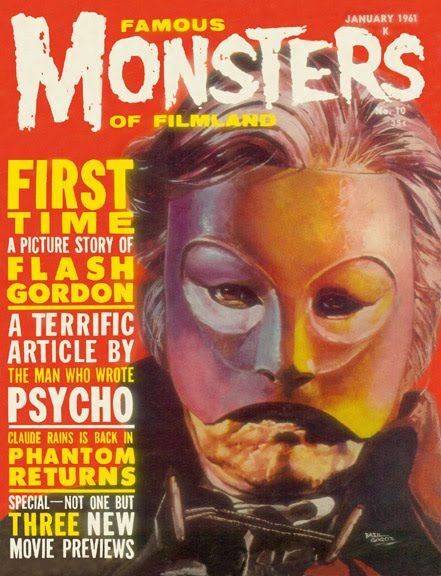 "Gerard" cradles his son in his lap as "Christine" removes "Erik's" mask and looking at him gives the dying "Phantom of the Opera" a loving smile. 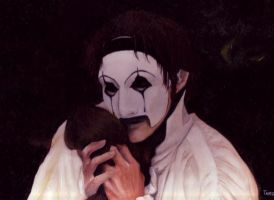 "Erik" dies in his father's arms, "Christine" replaces the mask and leaves with "Philippe". 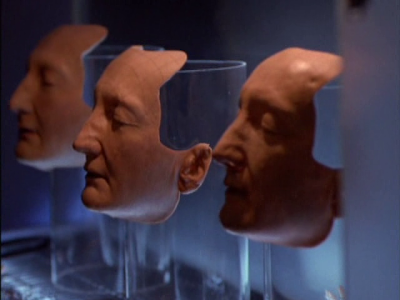 Over the length of the mini-series Charles Dance wore several different masks. 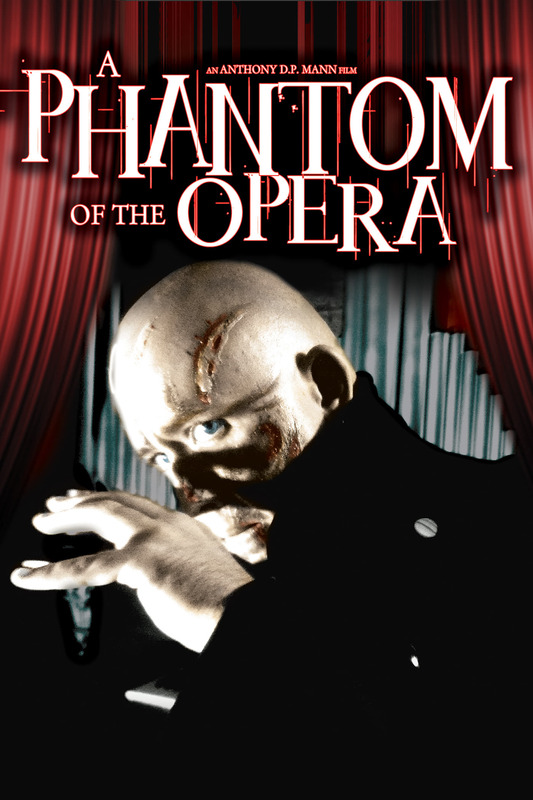 On June 7, 1991 a film shot of an original Florida stage production of "The Phantom of the Opera" was broadcast on some television stations. The play was described as a horror/comedy/musical written by Bruce Falstein. Falstein's tale has both "Christine" and "Raoul" as children and adults as mentioned in Gaston Leroux's novel. The story also included the "Persian" and "Christine's" father.. This production, starring David Staller and Elizabeth Walsh, is not the musical by Andrew Lloyd Webber. 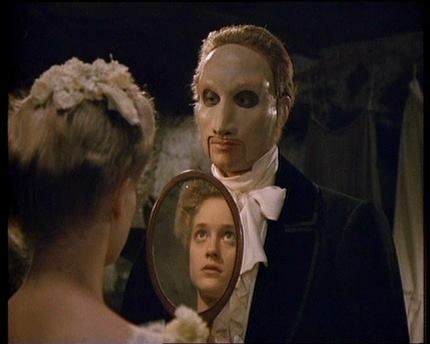 The Phantom of the Opera combines a romantically enticing book, which follows closely to the original novel, plus a bright musical score by Lawrence Rosen and Paul Schierhorn that ranges from pop to traditional musical-comedy styling. Thus, the Hirshfield Theater has created a dramatically new musical comedy. From the opening dream ballet depicting the young heroine, Christine, to her susceptibility to the mad Victorian Phantom (who oozes a sinister charm), Ken Kurtz's settings evoke all the mystery and color of this classic story of love and terror. From the Paris Opera House to the catacombs of the Phantom's Lair, "The Phantom of the Opera," filmed before a live audience, brings to life Gaston Leroux's 1911 classic novel like no other musical production in the history of stage and screen. In 1995 the Public Broadcasting System (PBS) had a series for children about a dog named "Wishbone". Some of the stories he imagined himself in were very adult in concept. Lon Chaney, Sr. had played the "Hunchback of Notre Dame" and PBS had "Wishbone" appear as "Quasimodo".. Then there was the 37th episode of the first season. This time "Wishbone" portrayed the "Viscount Raoul de Chagny" in a story entitled "Pantin' at the Opera". Then leave it to the "Disney Channel" to turn Gaston Leroux's novel into a pre-teen/teen movie entitled "The Phantom of the Megaplex". Shown originally on November 10, 2000. The film involves the adventures of two brothers 17 year old "Pete Riley", Taylor Handley, 12 year old "Brian", Jacob Smith, and their 13 year old sister "Karen", Caitlin Wachs, at a major movie premier called "Midnight Mayhem". 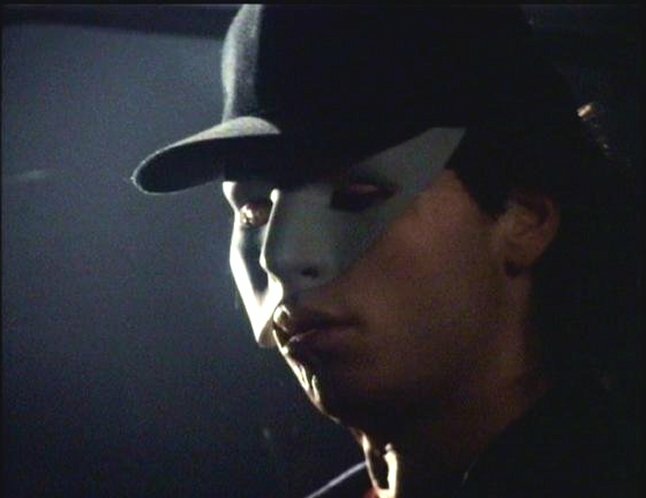 The Phantom turns out to be "Shawn McGibbon", Rich Hutchman, who is the senior manager of the Megaplex and wants to stop "Pete" from getting the permanent position. I have given my reader a look as to how popular Gaston Leroux's character has become over the decades since he first appeared in print. Currently Universal Studios is reworking their own Classic 1930's and 1940's Horror films as their "Dark Universe". The first of the reboots "The Mummy" came out last year in 2017. At present for 2019 release production is in progress for a reboot of "The Bride of Frankenstein". Also announced last year was a planned reboot of "The Phantom of the Opera".